Made from the finest 6061 T6 Aluminum. These Bulkheads are as strong as they are great looking! These Bulkheads were designed for the ultimate in strength, yet lightweight. Bulks are machined out of billet 6061 aluminum for durability and strength. 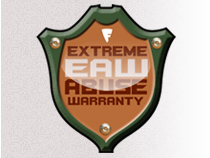 Fast Lane's extreme abuse warranty. This should be the first part replaced on your Maxx. Because once you replace it, you can forget about it.